Sports Diaries: Super Mario or Mad Mario? Mario Balotelli, a 21-year old Italian footballer, signed for Manchester City F.C in August 2010 for a reported €22 million. Here began one of the most tumultuous stories of the Premier League era. Balotelli is a handful, in fact most definitely more than a handful, but is he worth the trouble? Lets look at Mario’s achievements in the league so far and some of his mad moments, of which there are plenty to choose from, and discover whether he is a good thing for the Premier League or whether he is a becoming a bad influence on both the Premier League and young males living in England. There is a good side to Balotelli that has earned him the nickname ‘Super Mario’. Balotelli is a strong, powerful forward, very direct with a great shot on him; occasionally he shows promising signs of becoming a very good footballer. He is one of those exciting, firecracker players everyone would love to have in their team, you never know what he is capable of doing next. 17 goals in 32 games this season along with a Premier League winners medal is by anyone’s standards a successful season. He played a pivitol role this summer with Italy, scoring three goals, including both in the 2-1 win over Germany in the Semi-Final, as the Azzurri reached the final. But all of his achievements are consistently over-shadowed by the way Balotelli carries himself both on and off the pitch. On the pitch, Balotelli is Jekyll and Hyde. There are countless examples of this from last season. 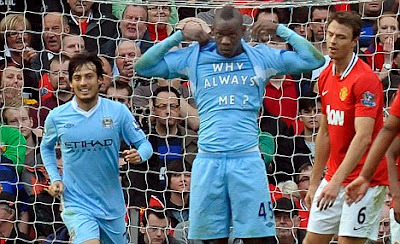 Against Liverpool in November, Balotelli entered the fray in the 65th minute before departing in the 83rd after 2 yellow cards for petty, blatant and unnecessary fouls; an almost identical incident to this occurred against Arsenal towards the end of the season, which could have cost City the title. Balotelli was also retrospectively banned for four games following a stamp on Tottenham’s Scott Parker that went unnoticed; naturally Balotelli was the match winner that day, scoring an injury time penalty. It is these on field antics that taint Balotelli’s talent. Even as a substitute he cannot stay out of the headlines, reportedly using his iPad on the bench during an international match. If he wants to become the player many believe he can, he must lose a certain aspect of his unpredictability from his character; otherwise people will begin to lose faith in him. It’s not the on-field problems that are Balotelli’s biggest problem; it’s his erratic and irresponsible behavior off it that’s of most concern. · In March 2011, Balotelli was accused of throwing a dart at a Manchester City youth-team player for which he was fined £100,000. · After crashing his car in the first few weeks of living in Manchester a policeman asked Balotelli why he was carrying £5000 cash on the passenger seat to which he replied ‘Because I am rich’. · The night before the first Manchester Derby this season, Balotelli had to flee his house after fireworks were set off in his bathroom. · In November 2010 Mario reportedly pulled into a petrol station and told everyone to fill their petrol tanks up, as he was going to pay for it. · On New Years Eve 2011, Balotelli reportedly rounded up around 20 homeless people in Manchester and paid for them to stay in the Hilton Hotel in the city centre. Under good football management, Balotelli can work on stamping out those ‘hot head’ moments on the pitch but away from football, the Italian youngster has no one to guide him. Living on his own in a foreign country without any rules to abide by, he has free reign to do what he wants and this he does. He needs to learn quickly how to deal with being a well-known face. What Balotelli fails to grasp is that his behavior has knock on effects for those young football fans that view him as a hero, as someone to aspire to. They see him acting the fool and they think its cool. Admittedly after the firework incident he began working with the Manchester Police fronting a firework safety campaign but it almost seemed like a ‘tongue-in-cheek’ move by the young Italian. The message he is sending out to young football fans is a bad one; he is living life with no rules and to impressionable young fans, it looks like a lot of fun. Is Balotelli good for the Premier League? In purely a football sense, yes he is. He is young and once he rids himself of his temper issues, he will be one of the most exciting footballers to watch. But, he has to address the way he lives outside of football; he must begin acting like a good ambassador for the sport, as someone to aspire to or else risk losing the faith many have placed in him. For one too many more stories like those above will put serious strain on his relationship with the British Public. We all love a controversial figure, but at some point the controversy has got to stop.